Download "Course Descriptions NUR 3805 Nursing Roles, Dimensions and Perspectives 3 credits NUR 3069 Advanced Health Assessment 2 credits"
1 Course Descriptions NUR 3805 Nursing Roles, Dimensions and Perspectives 3 credits The discipline of Nursing has been identified as having the potential for making a major impact on the transformation of health care delivery to a safer, quality, and more cost effective system, thus improving healthcare outcomes across populations. This course facilitates the transition of the Registered Nurse with an Associate Degree in Nursing or diploma to the role of the BSN graduate. It encompasses the history, evaluation, ethical imperatives, trends and issues impacting the nursing profession in evolving and global health delivery environments. It explores the responsibilities and values of the nursing profession, communication theories and techniques, teaching learning concepts, critical thinking, and clinical reasoning and judgment. NUR 3069 Advanced Health Assessment 2 credits Registered Nurses are mandated to provide patient-centered care which identifies, respects, and addresses clients differences, values, and preferences, expressed and unexpressed needs. Advanced health assessment addresses the totality of the client including the spiritual aspects of health, disease/disability, and the individual client s perceptions of the health/illness spectrum. The determination of the health/illness status of the client within the context of the client s socio-cultural values is essential in providing the framework for planning, implementing, communicating, and evaluating the outcomes of care. This course provides the knowledge, skills, interviewing and interactive techniques needed to obtain and communicate a systematic, culturally-appropriate, comprehensive health history and physical examination. It addresses pathophysiological processes, critical thinking and analysis, clinical reasoning and judgment in order to provide safe, ethical, quality care across life spans and populations. NUR 3069L Advanced Health Assessment Lab 1 credits The Advanced health Care Assessment addresses the totality of the client including the spiritual aspects of health, disease/disability, and the individual client s perceptions of the health/illness spectrum. The determination of the health/illness status of the client within the context of the client s socio-cultural values is essential in providing the framework for planning, implementing, communicating, and evaluating the outcomes of care. This laboratory course provides the knowledge, skills, interviewing and interactive techniques needed to obtain and communicate a systematic, culturally-appropriate, comprehensive health history and physical examination. It addresses patho physiological processes, critical thinking and analysis, clinical reasoning and judgment in order to provide safe, ethical, quality care across life spans and populations. 2 NUR 3119 Nursing Concepts and Theories 3 credits The profession of nursing is the culmination of concepts and theories. Concepts and theories are the body of knowledge used to support nursing practice. Nursing recognizes that socialization into a discipline is guided by theories use of language, identification of concepts and definition of relationships, structured ideas and facilitation of disciplined inquiry, practice and communication, as well as predicting outcomes of nursing practice. The Nursing Concepts and Theories course will explore the major constructs, theories, and models that form the foundation of nursing. The course will also investigate the history and evolution of nursing leaders, evolving issues, concepts, and theories, and their application to nursing practice. Ethical issues as they relate to advocacy, self-determination and autonomy for the client as well as for the profession of nursing are addressed to assist the student to achieve an individualized professional perspective of nursing. Students will engage in constructive dialogue as they begin to conceptualize nursing phenomena in an area of interest. NUR 3167 Nurse as Scholar 3 credits Present aspects of scholarship that support the values of the nursing profession committed to both social relevance and scientific advancement. The practice of nursing derives knowledge from a wide array of other fields and disciplines adapting and applying this knowledge as appropriate to professional practice. This course examines these interrelationships and allows the nurse to utilize scholarly evidence to design and implement nursing care that is high-quality and cost effective to address issues important to the profession of nursing to question assumptions and to utilize clinical reasoning and judgment. The course emphasizes skills of inquiry, analysis, information literacy, critical thinking and utilizing various communication modalities. 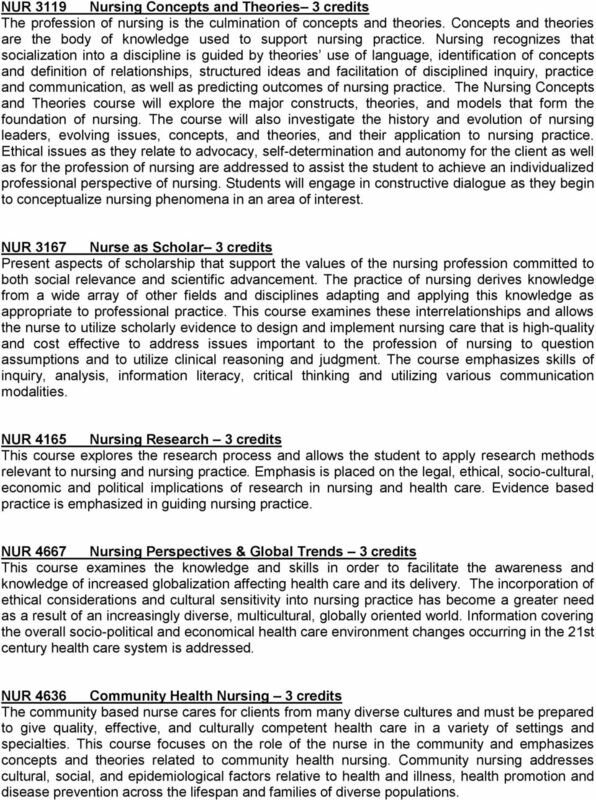 NUR 4165 Nursing Research 3 credits This course explores the research process and allows the student to apply research methods relevant to nursing and nursing practice. Emphasis is placed on the legal, ethical, socio-cultural, economic and political implications of research in nursing and health care. Evidence based practice is emphasized in guiding nursing practice. 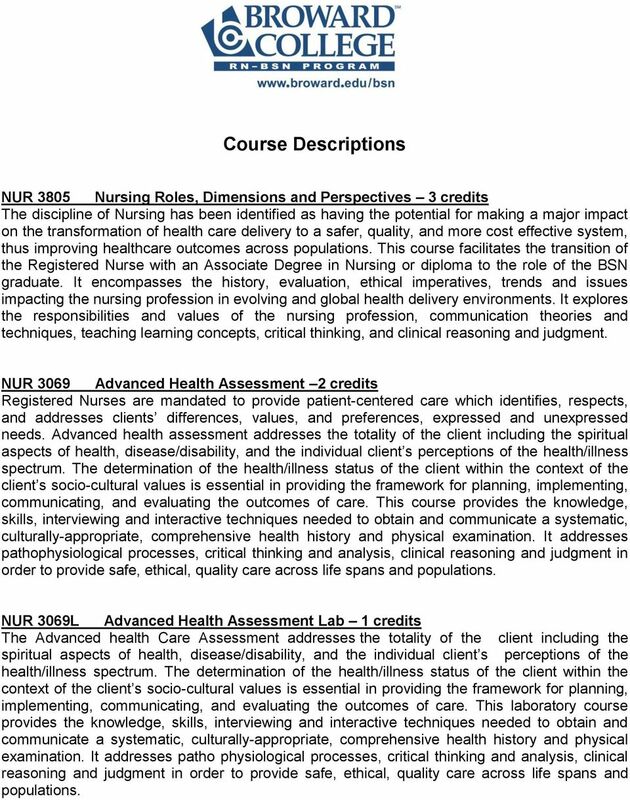 NUR 4667 Nursing Perspectives & Global Trends 3 credits This course examines the knowledge and skills in order to facilitate the awareness and knowledge of increased globalization affecting health care and its delivery. The incorporation of ethical considerations and cultural sensitivity into nursing practice has become a greater need as a result of an increasingly diverse, multicultural, globally oriented world. Information covering the overall socio-political and economical health care environment changes occurring in the 21st century health care system is addressed. NUR 4636 Community Health Nursing 3 credits The community based nurse cares for clients from many diverse cultures and must be prepared to give quality, effective, and culturally competent health care in a variety of settings and specialties. This course focuses on the role of the nurse in the community and emphasizes concepts and theories related to community health nursing. Community nursing addresses cultural, social, and epidemiological factors relative to health and illness, health promotion and disease prevention across the lifespan and families of diverse populations. 3 NUR 4636L Community Health Nursing Practicum 2 credits This course presents clinical concepts of community health nursing focusing on the community as client and the multiple determinates of health in community health care settings. The learner will participate in selected community based clinical activities and various community agencies as an interdisciplinary provider, designer, and manager in the process to provide competent care, promote health protection, provide assistance with health maintenance and health restoration to a diverse population within the community. NUR 4827 Principles in Nursing Leadership & Management 3 credits This course provides a forum for the examination and discussion of concepts, theories, and principles of leading and managing for the nurse manager to be effective in today s diverse and global health care environment. Grounded in evidence-based, best practices, the ethical, economic, legal and political context of contemporary health systems are examined in terms of role development, interpersonal skills, networking, facilitation of groups, provision of quality care and quality improvement, budgeting and resource allocation. Health care systems, outcomes management, clinical judgment as it pertains to nursing management, and health and safety goals are emphasized across practice settings. NUR 4945 Nursing Capstone 2 credits Professional practice of the Registered Nurse focuses on health promotion; risk reduction; direct and indirect care of clients, families, groups, and populations; and providing the human interface between health care systems and the client. Following the completion of all required RN-BSN, general education, state of Florida and program pre-requisite course requirements, the Nursing Capstone requires the student to demonstrate the competencies consistent with program outcomes and to synthesize the knowledge, skills, concepts and theories he/she has attained in a written and approved professional portfolio. The course provides the student with the opportunity to enhance his/her knowledge and expertise in selected areas of nursing practice, including but not limited to specialty clinical nursing practice, nursing administration, nursing education, and community health nursing. NUR 4945L Nursing Capstone Practicum 2 credits Professional practice of the Registered Nurse focuses on health promotion; risk reduction; direct and indirect care of clients, families, groups, and populations; and providing the human interface between health care systems and the client. 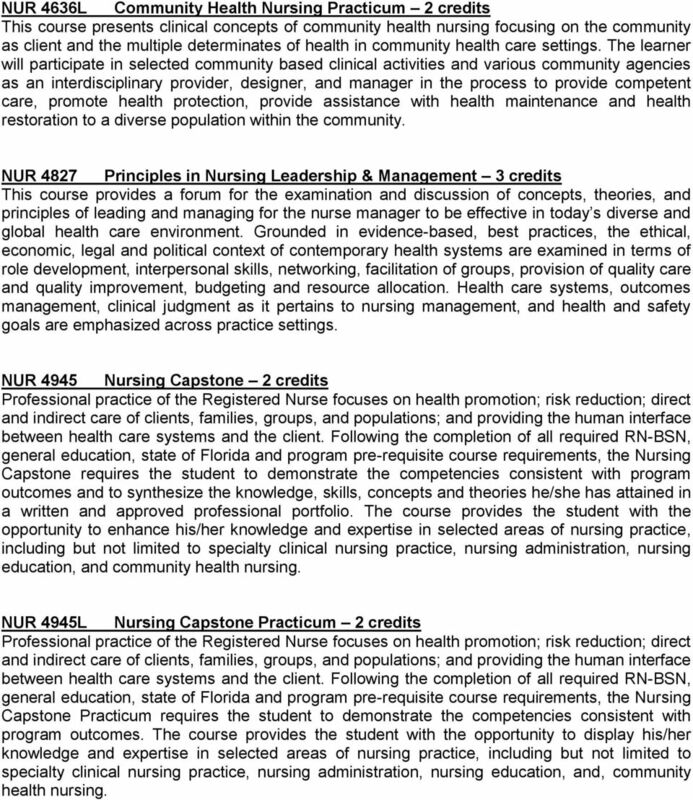 Following the completion of all required RN-BSN, general education, state of Florida and program pre-requisite course requirements, the Nursing Capstone Practicum requires the student to demonstrate the competencies consistent with program outcomes. The course provides the student with the opportunity to display his/her knowledge and expertise in selected areas of nursing practice, including but not limited to specialty clinical nursing practice, nursing administration, nursing education, and, community health nursing. 4 Elective Course Descriptions NUR 3678 Nursing Care of Vulnerable Populations 3 Credits Caring for the vulnerable is an imperative for the compassionate, caring, effective and competent nurse. This course focuses on health issues affecting at-risk and vulnerable populations and how nurses can advocate reducing disparities in health care systems and health care delivery. The course emphasizes the interrelationships of socio-cultural and public health care systems. Barriers to the navigation and utilization of health care systems are explored as related to the economical, legal, political and cultural aspects of health protection and health maintenance. NUR 4284 Dynamic & Contemporary Issues in Aging 3 Credits The aging population will affect the skills and services the healthcare workforce must be equipped to provide and the settings in which the care is provided. This course will provide an in-depth understanding of the concepts in normal aging, issues related to the client in communities, and health care issues confronted by the elderly. The impact of the elderly on society, end-of-life issues, the application of current theories and evidence of elderly, and available and potential health care systems and services are explored. NUR4195C End-of-Life- 3 Credits This course is designed to recognized death as the last stage of human growth and development. With a focus on the physical emotional, psychosocial, Spiritual and cultural considerations at the end-of-life, the student will explore ethical and legal issues to enhance their skills and knowledge when working with patients and families at the end-of-life. 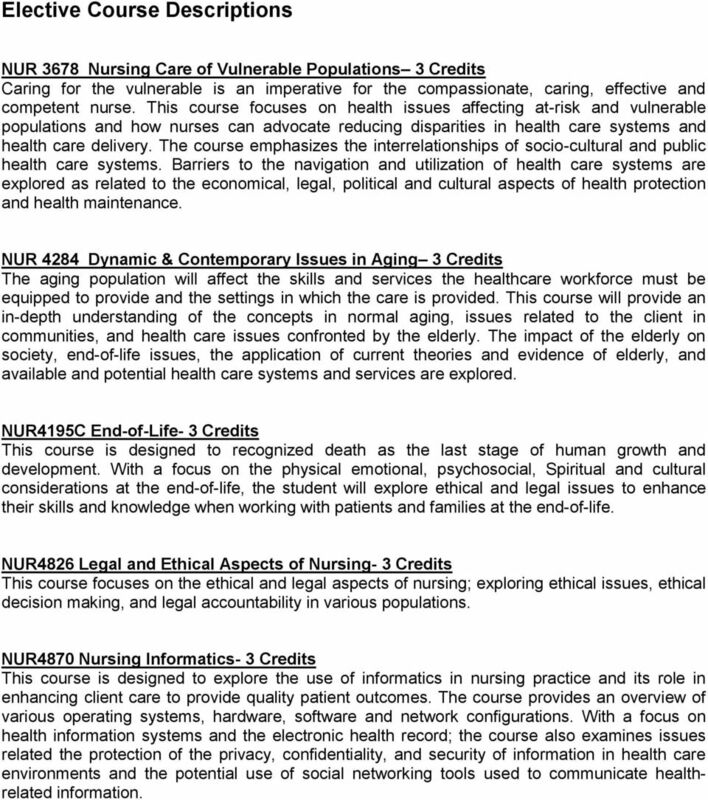 NUR4826 Legal and Ethical Aspects of Nursing- 3 Credits This course focuses on the ethical and legal aspects of nursing; exploring ethical issues, ethical decision making, and legal accountability in various populations. NUR4870 Nursing Informatics- 3 Credits This course is designed to explore the use of informatics in nursing practice and its role in enhancing client care to provide quality patient outcomes. The course provides an overview of various operating systems, hardware, software and network configurations. With a focus on health information systems and the electronic health record; the course also examines issues related the protection of the privacy, confidentiality, and security of information in health care environments and the potential use of social networking tools used to communicate healthrelated information. 5 New Course Approved NUR 4128 Patho-Pharmacological Concepts in Health Care - 3 Credits This course provides the student with the basic understanding of pathophysiology related to human illness and pharmacotherapy related to the application of drugs for the purpose of disease prevention and treatment, within a systems framework. Emphasis is placed on biological theories and principles that provide a basis for understanding pathophysiology as an alteration in the normal physiology functioning of subsystems from conception to end of life and the chemical agents that are capable of producing biologic responses within the body. The course uses critical thinking processes to analyze diverse client presentations of selected illness for symptomatology, pathophysiology, and health care implications. 1 Graduate Program Objective #1: Integrate nursing science and theory, biophysical, psychosocial, ethical, analytical, and organizational science as the foundation for the highest level of nursing practice. Common Outcomes/Competencies for the CCN Nursing Web Page NURS 120: Foundations of Nursing This course introduces concepts related to the practical nurse s roles and responsibilities in today s society. NLN Competencies for Graduates of Practical/Vocational Programs (2012) which LPN Programs shall meet. To have a global reputation for transforming health care through innovative nursing practice, education, and research. COURSE NUMBER: N199 COURSE TITLE: Fundamentals of Nursing COURSE DESCRIPTION: Fundamentals of Nursing is a theoretical and clinical course which provides an introduction to nursing and patient care concepts. Develop students abilities to serve as Christian leaders in professional nursing roles and to be contributing members of the profession of nursing. Clinical Practicum From the second semester of the sophomore year, students will engage in clinical practice in various clinical settings.